Pan seared chicken served under a tasty sauteed tomato sauce with hints of balsamic vinegar and a bunch of fresh herbs. These days the farmers market has been absolutely packed with fresh local produce! There is so much selection that it is often difficult to choose just what to get. When I came across this recipe for chicken with tomato herb pan sauce on Pink Parsley it seemed like the perfect way to celebrate summer by incorporating so many of those fresh in season ingredients! Right now the tomatoes are at their best and I hardly needed an excuse to make a dish that includes them and when you lure me in with a simple pan sauce that is as tasty sounding as this one is, I did not stand a chance and I just had to make it. 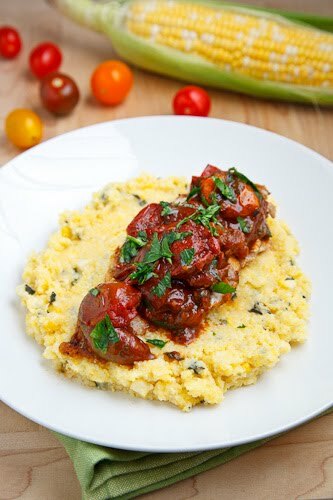 In addition amazing sounding chicken in tomato pan sauce I also really liked that it was served on polenta made with fresh corn and basil bring even more fresh ingredients to the table! Mix the butter, garlic, oregano and paprika. Pat the chicken dry, season it with salt and pepper and dust it with the flour. Melt 1 tablespoon of the butter into the oil in a pan over medium-high heat. Add the chicken and sautee until the chicken is golden brown and cooked through, about 3-4 minutes per side and set aside. Add the tomatoes and cook while stirring until they start to char and burst open, about 5 minutes. Add the remaining butter and the balsamic vinegar. Crush the tomatoes and deglaze the pan using a wooden spoon. Remove from heat and stir in the basil, oregano and parsley. Slice the chicken, mix any juices into the tomato sauce and serve with the sauce spooned over the chicken. Creamy smooth polenta with juicy corn kernels and fresh basil. Bring the water and salt to a boil in a large sauce pan. Reduce the heat to medium-low and simmer until tender, stirring occasionally. Remove from heat and mix in the butter, parmigiano reggiano, corn and basil. I love polenta it's so yummy. That. Looks. So. Good. Dude! Oh, that dish is absolutely beautiful! What wonderful flavors. I love polenta, this looks so good! Very nice. The flavors really pop. I made this last week too! I loved the pan sauce, as did my non-tomato-loving husband. I used grits instead of polenta and wasn't that wowed by them. Next time I'll have to see if the polenta makes it better. Great recipe, I love polenta!. Love all of the fresh ingredients and everything about this dish Kevin. I've never thought of putting corn in polenta and know I'd love it. Great flavors in this, and you're right — perfect for all the late summer produce. I'd love to try this! Looks delicious, I'd die to have this. love the photo. This has been on my list of things to make too since I saw it on Pink Parsley, love it! I've always been wary of polenta, however this recipe has motivated me to finally try it…bravo! I absolutely love polenta…this looks good! Does the corn go in raw? I have been wanting to make polenta for ages now – this recipe has inspired me to finally do it. Look delish! Nice pan sauce, that is the one thing I miss out on from grilling so much. Why, oh why haven't I thought about adding fresh corn to polenta? What a great idea! And the tomatoes and chicken look absolutely divine. Wow, this LOOKS amazing! Excited to try. This sounds and looks amazing!!! 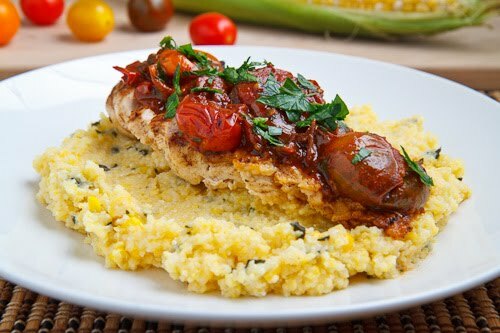 I love polenta with fresh corn, the chicken and pan sauce would be the perfect compliment! Third time doing this recipe I love it, thanks for your recipes really easy and delish!